Property 7: Ohiwas' Best Bach, Clean, Cosy and Private. Property 8: OHIWAHEAVEN True traditional Kiwi Bach Secluded!! Property 9: Retro Bach + Fresh Water Hot Tub or Plunge Pool. Property 11: Family Friendly Beach Bach - Pets can come too! 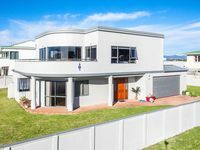 Property 22: Modern 5 Bedroom Beach House in Ohope! Property 24: Fruit Forest Studio accommodation - longstanding organic property, ocean views. We had a great time. House was clean and detailed as listed. Needs blinds in the bottom room. Don't recommend the store next door for dinner or coffee. Very close to beach and Harbour wharf. Great communication from owner...fantastic would stay again. Thanks for having us!